Going into the remake of “Mother’s Day”, I was a bit apprehensive. The original, while fun, is hardly a classic and I was afraid they were going to play up this remake with every camp value that most horror fans love in the original. It was to both my delight and my shock that this remake is played deadly straight. Whatever comedy here is of the blackest kind and dark comedy fans will be delighted. The film begins after a bank robbery has gone wrong, three brothers, Izzak “Ike” (Patrick Flueger), Addley (Warren Kole), and Johnny (Matt O’Leary) are on the run from the law. The three brothers travel to their mothers house, however find it occupied by young couple Beth (Jaime King) and Daniel (Frank Grillo), who are hosting a birthday party in their basement. The guests include Anette (Briana Evigan) and her fiance Dave (Tony Nappo), married couple Treshawn (Lyriq Bent) and Gina (Kandyse McClure), George (Shawn Ashmore) and Melissa (Jessie Rusu) and Julie (Lisa Marcos). As the three brothers enter the house, the partiers are watching a storm warning of a tornado that is soon to hit, however Daniel reassures everyone that the basement is secure. He then heads upstairs where he encounters the brothers who think Daniel is trespassing in their mothers home. He tells them they got the house months previous in a foreclosure. While the brothers begin to beat Daniel, Beth comes upstairs but is unable to escape. The brothers threaten to shoot the couple, however Beth informs them that George is a doctor and he will be able to help the dying Johnny. Beth calmly summons George upstairs since she does not want to alarm the other guests. After Ike and Addley refuse to take Johnny to the hospital, George begins to try to save Johnny. Meanwhile, Ike receives a phone call from his sister Lydia (Deborah Ann Woll) who is with the siblings “Mother” (Rebecca De Mornay). Ike tells the pair to come to the house. Julie soon emerges from the basement but is chased back downstairs by Addley who holds the guests hostage, removing the groups cell phones and wallets and begins to torment them. Soon after, Mother and Lydia arrive. Mother is extremely unhappy with her sons after they failed to successfully keep in contact with her, so she was unable to tell them she lost her home. She angrily tells off her sons and proceeds to be nice to the hostages, telling them no one has to get hurt and the family would leave once Johnny’s condition has stabilized. However, Mother soon discovers that the sons had continued sending money to the house after she had moved out, meaning Beth and Daniel must have received it. Both deny knowing about the money, but Mother does not believe Daniel and has his hand broken by her sons. Despite this, Daniel still denies knowing. Mother proceeds to rob the hostages, taking their credit cards and pin numbers. Melissa attempts to escape by running upstairs, however she is shot by Addley. Can the rest of the crew survive the night and does mother really know best? 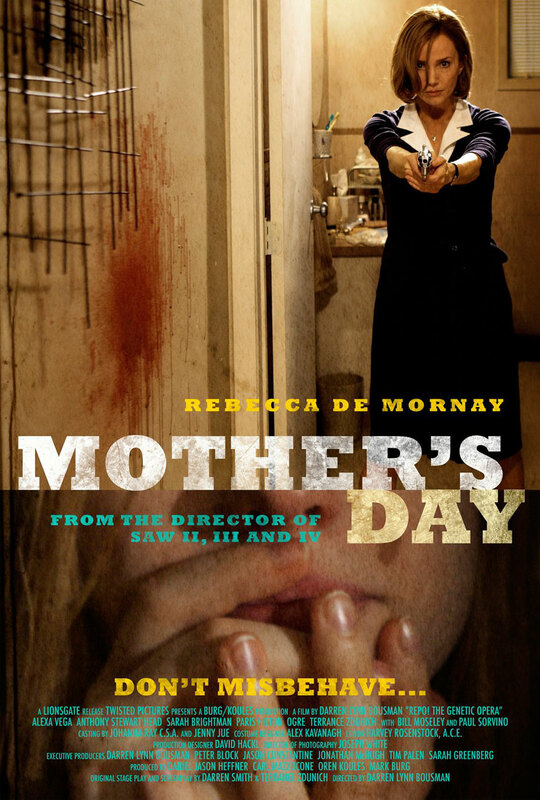 “Mother’s Day” is one of the craziest, most fucked up suspense horrors that I’ve seen in a while and this is coming from a guy who watched “Human Centipede II” less than a week ago. The kills are quite extreme. Wanna see a girl shot in the face in extreme close up? It’s here. The film may be nearly two hours long but not a single scene seemed the slightest bit padded. The performances are all around excellent with special acclaim due to Rebecca De Mornay who is perfect in the role as the cunningly evil mother. She could have played this role over-the-top but not a single bit of her performance feels mannered or theatrical. She plays this as a real mother. A real psycho mother, yes, but a real mother none-the-less.